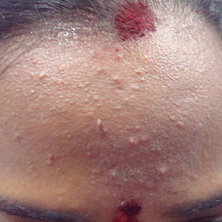 20 volunteers with acne were instructed to apply Eve fresh pimple cure cream paste first and wash after fifteen minutes. Post wash Eve fresh cream was applied and this was followed twice a day for duration of four weeks. 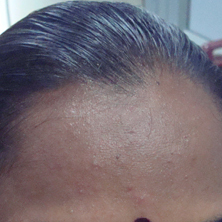 Improvement in skin colour was observed from first week onwards. Ten volunteers engaged in outdoor activities and their skin region treated with Dual therapy showed no erythema formation which indicates the sun protection effect of the product. Water resistance test performed by measuring the erythema in the Eve Fresh Pimple cure cream paste applied skin exposed to sun and was compared with normal sun exposed skin. After fifteen minutes, the erythema readings of both were recorded. Same procedure was repeated for Dual therapy treated skin and compared with normal skin. After fifteen minutes the erythema readings were recorded. Sun protection effect observed post wash in both mono therapy and dual therapy suggests the strong adhesion of Eve Fresh Pimple cure cream paste to the skin. Staphylococcus epidermidis is common bacteria found on human skin and plays a role in acne/pimple form eruptions. After use of Eve Fresh Pimple cure cream paste as per the usage instructions, swab sampling was done at 0,2,4,6 and 8 hours from skin region. The same procedure was repeated for Dual therapy. Significant reduction in the number of Staphylococcus epidermidis colonies on the skin was observed after a single use of Dual therapy when compared with Mono therapy.